Kick Energy rally driver Steve Perez and co driver Staffan Parmander have finished in a fantastic third position. Out of everything I've done in rallying, including all the wins I've had, this has to be my greatest achievement. This has given me so much pleasure and just to get to the finish is amazing, let alone on the podium. 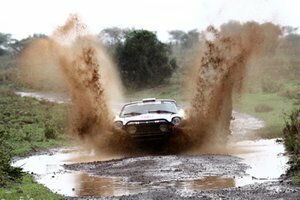 the Datsun ran prefectly for a gruelling ten days where there was traditional safari wet weather! even more amazing was that this was the second time the wring loom had been to Africa!